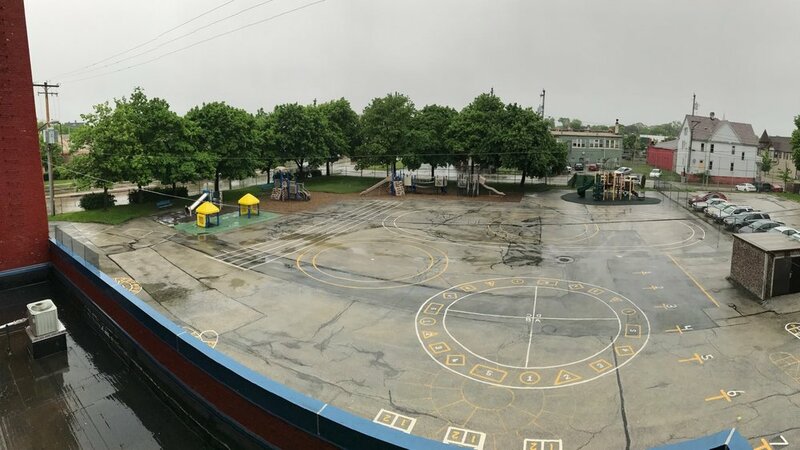 The plan centerpiece includes a reduction of about 80% of the playground asphalt, replacing it with green space and a large, permeable rubber play surface in the shape of Lake Michigan. This place-based art feature, which also identifies cities around this Great Lake, connects outdoor learning, the arts, social studies, and green infrastructure. The plan also calls for safer play equipment, including a set of three slides that empty on the western edge of the Lake Michigan play surface. The slides represent the three major rivers in Milwaukee, affording further opportunities to educate students about their relationships to local systems. An outdoor classroom will include a shelter with seating for 30 students. Rainwater is captured from the shelter roof and retained in a rain barrel to be used for watering the nearby raised-bed gardens. The roof angles to a center, translucent gutter that routes water to a rain barrel and offers an opportunity to observe the collection of rainwater in action. The supports for the outdoor classroom are clad with vertical slats from which chalkboards can be hung. The slats are spaced so that visibility is maintained through the structure but noise from the neighboring busy 27th Street is reduced. Precast concrete pavers are proposed for flooring. Permanent recycled plastic lumber benches offer seating and work spaces for students that are both secure and offer opportunities for creative, team-based outdoor classroom activities. About 80% of playground asphalt will be removed, replaced with a rubber surface representing Lake Michigan, with three slides representing Milwaukee’s three rivers emptying onto it. Starms ECC’s schoolyard redevelopment will be the anchor of the community by providing a safe green space at the intersection of 27th and North Avenue. Our closest park is over a mile away. We would encourage community to use our grounds after school and on the weekends. We see our schoolyard as being the launching pad of learning for generations to come here at Frances Starms Early Childhood Center.